To Sum It Up: As one of the recipients of an internship at the Lexington Hotel in Chicago, sixteen-year-old Haven Terra is about to enter a world filled with power and extravagance. The opportunity to walk among famous figures on a daily basis seems like a dream come true. Although everything about the hotel and its staff exudes perfection, Haven soon begins to sense that there’s something sinister going on behind all of the glamour. Her search for answers uncovers an evil plan that Haven must stop by fulfilling the destiny that she never knew existed until now. Review: When I first eyed the size of this book, which clocks in at a little over 500 pages, I figured that a lot of exciting things must happen in it. Unfortunately, that’s not quite the case. The pacing in Illuminate is very slow, at least for a reader like me who needs periodic bursts of action to maintain my interest in a story. I’m all for building up suspense, but I don’t believe in making readers wait forever for the payoff. I really had a hard time focusing on this book and struggled to finish it. The protagonist, Haven, is yet another I’m-so-ordinary-there’s-no-way-I can-be-extraordinary main character. In the beginning, I thought she was okay. She’s an exemplary student and a photography enthusiast, which grabbed my attention because I love taking pictures and messing around with Photoshop. So I harbored high hopes of liking Haven. She never really materializes into a dynamic heroine, though. If it weren’t for the mysterious book that magically appears one day to give her instructions on how to unravel the nefarious plot that’s underway at the hotel, Haven probably wouldn’t have made much progress on her own. I wish that she had been more of a take-charge type of protagonist. The secondary characters are similarly run-of-the-mill. Aurelia Brown, the owner of the Lexington Hotel, is your stereotypical boss from hell (almost literally). Aurelia’s lieutenant, Lucian Grove, is the inhumanly good-looking mystery man whose talents include smirking and turning on the charm. Of course Haven completely falls for him. I think that the most relatable character in the bunch is Lance, one of Haven’s classmates and fellow interns. He certainly shows the most development over the course of the book. At first Lance is sort of just there, lurking on the periphery of things, but by the end of the novel, he’s turned into a certifiable hero. This is exactly the kind of transformation that I wish Haven’s character had undergone. The true star of Illuminate is the Lexington Hotel. Agresti does a stellar job of bringing its grandeur and opulence to life. Even with all of the creepy business that goes on there, I’d probably still accept an internship just so I could explore the impressive library and sample some of the delectable desserts that are described in mouth-watering detail. The setting of this book is so vivid; if only the characters brimmed with the same intensity. Illuminate includes nods to Oscar Wilde’s The Picture of Dorian Gray, Dante’s The Divine Comedy, and Goethe’s Faust. In the end, though, the story boils down to your standard battle between good and evil and doesn’t really venture into new territory. 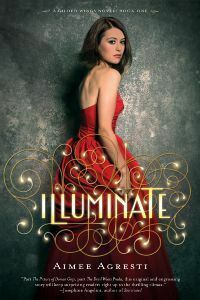 As fascinating as the world of Illuminate is, it’s not enough to keep me invested in the series. All in All: I’m not very patient when it comes to drawn out plots and passive main characters, so this book and I just weren’t destined for each other. If Illuminate had been condensed by about 200 pages, I might have formed a different opinion of the book. I have heard thus many times about this book. I really don't enjoy slow books, especially when they are so long! I don't enjoy reading slowly paced books, either. I kept waiting and waiting for the action to get rolling in this one, and by the time that it did, I just wasn't that interested anymore. I am just like you. I get bored easily so books that really take their time to really start end up in my DNF pile. This book ended up in my DNF pile. I wanted to put it down at page 50 but pushed myself to page 100 hoping it piqued my interest. Sadly it did not. I also stopped because there was over 400 pages to go. If it had been shorter I would have probably continued my struggle to like it. I also pushed myself to continue reading this, hoping that if I read just a little further, the story would really take off. By the time that I realized that this wasn't going to happen, I had invested so much time in reading this book that I figured I might as well see it through to the end.